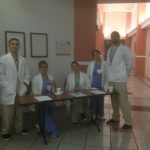 (FNU) students were invited by Ms. Michele A. Grassi, MHA, BS, RRT, Pulmonary Clinical Specialist at South Miami Hospital to participate in the 21st Annual Harry Kapp Symposium. 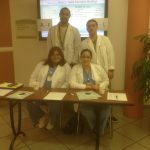 This year, FNU respiratory therapy students participated in the symposium by helping with registration and passing out literature. In return for their services, the students were treated to breakfast and lunch, and they were allowed to attend all of the lectures. In addition, FNU students were given the opportunity to meet professionals in the respiratory therapy field and to begin networking towards their future positions once graduated. Representing the FNU Respiratory Therapy Department was Professor Jose Antonio Lammoglia, Respiratory Therapy Department Head; Professor Alberto Alegret, Director of Clinical Education and Professor Richard Allen. Also in attendance was Dr. Loreto Almonte, Allied Health Division Head. Ms. Grassi is a member of FNU’s Respiratory Therapy Program Advisory Board. She has recently been reappointed by the Governor of Florida to the Florida Board of Respiratory Care. Ms. Grassi was very impressed with the FNU students’ performance during the symposium. 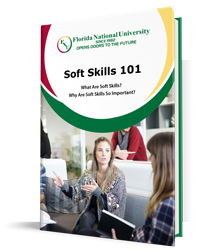 Florida National University has an ongoing and very positive relationship with South Miami Hospital, and the University looks forward to many new ventures together. 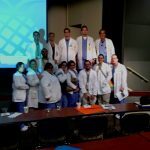 The Harry Kapp Symposium is an annual tribute to the late Harry Kapp, a respiratory therapist at South Miami Hospital who is remembered for his smile, professionalism, compassion and continuous search for knowledge. This symposium is an annual meeting put on by the South Miami Hospital’s Respiratory Therapy Department. It is geared to respiratory therapists and opened to all medical personnel interested. The symposium is an opportunity to focus on educational topics, ideas and information that are in the forefront of respiratory therapy education, and is part of the hospital’s Respiratory Care Week celebration. To learn more about Florida National University’s Respiratory Therapy program, please call 305-821-3333.